Tag line: "A story of love, family and survival in the harshest place on Earth"
Produced for IMAX theaters (and originally released in 3-D), To the Arctic travels to the top of the world, where only the strong survive. But with the ice caps melting at an alarming rate, it may soon be impossible for any creature, great or small, to call this harsh, wondrous region their home. Narrated by Meryl Streep and featuring the music of Sir Paul McCartney, director Greg McGillivray’s 2012 film To the Arctic is a gorgeous yet informative motion picture about one of the coldest places on earth (temperatures regularly drop to 30 below in winter). The “stars” of the movie are a polar bear mother and her two cubs, which, according to a behind-the-scenes documentary, the crew of To the Arctic followed for seven full days, capturing moments both funny (hoping to avoid getting wet, one cub leaps onto a free-floating patch of ice, then moves quickly around it as the ice turns over under his weight) and frightening (it’s not uncommon for adult male polar bears to make a snack out of a young cub, and we watch as the mother and her brood scurry across the ice for miles to avoid one particularly hungry intruder). Though it documents the habits of several species, including birds, walruses, and caribou, it’s the polar bears who take center stage. But To the Arctic isn’t just a wildlife documentary; it also delves headfirst into an increasingly serious issue, namely the disappearance of the polar ice caps. Per the film, the area covered by sea ice has shrunk by 25% since 1980, and at the rate it’s melting, the ice could disappear completely by the year 2050. 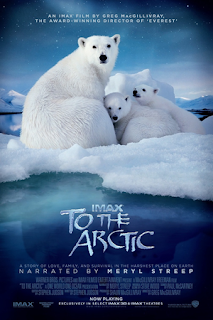 Over the course of the movie, we see how the vanishing ice is affecting the polar bears, who, in their search for food, must now swim out even further, and, on occasion, come home empty handed (a story is told of one polar bear that swam for 9 days and over 400 miles to feed her young cub, only to find it dead when she returned). Joined by scientists and sailors who’ve dedicated a fair portion of their life to this region, we learn just how devastating this problem could potentially be, both for the Arctic and the entire world, and suggestions are made as to how the melting, if not eliminated, can at least be slowed. Every bit as beautiful (along with scenes of the Northern Lights illuminating the sky, the movie features some amazing underwater photography), and equally as entertaining (thanks to its trio of polar bears) as your standard IMAX documentary, To the Arctic also serves a greater purpose, and here’s hoping its message doesn’t fall on deaf ears.